Vet Eye Specialist Orlando | Cataracts In Dogs Maitland | Cataracts In Cats FL - Animal Eye Associates, P.A. Vet Eye Specialist – What Do Dogs and Cats See? Many pet owners often wonder, “What does my pet see?” Vision involves many factors that are integrated by the brain to produce an image of the world. The factors involved include the field of view, depth perception, acuity (focusing ability), detection of motion, and perception of color. Research allows us to have an idea of what dogs and cats see. The field of view is determined by the position of the eyes within the head. Think of a horse, with eyes on either side of its head, which has a nearly 360 degree field of view. Dog eyes are placed closer to the midline than horses, but further than in people. This results in a 240 degree field of view for a dog, compared to a human field of 200 degrees. However, both dogs and cats have a narrower binocular field of vision than humans. The retina is a thin layer of tissue in the back of the eye that acts like the film in a camera. 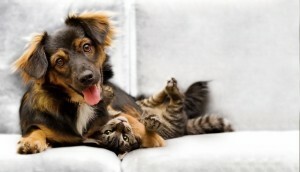 Dogs and cats have a special reflective layer underneath the retina, called the tapetum. This tapetum acts like a mirror, reflecting light within the eye to improve night vision. The tapetum is responsible for the “eye shine” you see when an animal looks into a car’s headlights. While the dog and cat eye has evolved primarily for dim light vision used during nighttime hunting, they do have some of the cells that specialize in bright light vision. These cells are called cone photoreceptors, and are also responsible for color vision. Cones make up approximately 20% of the photoreceptors in the central retina of the dog, compared to 100% in the central retina (macula) of the human. Studies of the dog suggest they can differentiate red from blue, but confuse red and green. The visible color spectrum in dogs is believed to be shades of blue and yellow (dichromatic). Humans, in contrast, have trichromatic vision. Visual acuity is the ability to focus and distinguish two objects as separate entities. In people, acuity is measured using an eye chart. In animals, acuity is measured using a technique called retinoscopy. In normal dogs, visual acuity is approximately 20-40% of humans. This means that at 20 feet, a dog can distinguish an object that a human can see at 90 feet. Acuity is greatly influenced by the clarity of the structures of the eye and by the combined refractive power of the eye. The main refractive (light bending for focusing) structures of the eye are the cornea and the lens. The lens is also used for accommodation, which is a change in focusing power to bring objects at different distances into focus. Dogs, however, can not change their focusing power as much as people, so they must depend on other senses (smell, taste) to supplement vision of very near objects. Cataract, or opacity in the lens, is a common disease that decreases the clarity of the eye. Cataracts in dogs are much more common than cataracts in cats, and we can help restore their vision. Contact the best eye specialist today!